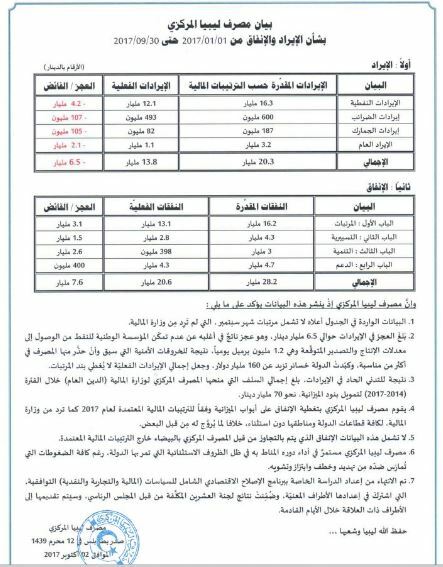 The Central Bank of Libya (CBL) has released the latest figures for the Libyan economy covering the period 01/01/17 to 30/09/17. The figures continue to show a poor performance by the Libyan economy with state revenues failing to cover state-sector salaries. Total state revenues for the first 9 months of 2017 were down by LD 6.5 billion from a projected LD 20.3 billion to just LD 13.8 billion. Oil revenues were down by LD 4.2 billion to LD 12.1 billion – from a projected LD 16.3 billion. Tax revenues were down LD 107 million from a projected LD 600 million to LD 493 million. Customs revenues were down LD 2.1 million from a projected LD 3.2 million to LD 1.1 bn. On the other hand, outgoings were also down by LD 7.6 billion from a projected spending budget of LD 28.2 down to LD 20.6 billion. State sector salaries were down by LD 3.1 billion from a projected 16.2 billion to LD 13 billion (These exclude September salaries which are still unpaid). Operational spending was down by LD 1.5 billion from a projected LD 4.3 billion to LD 2.8 billion. Worryingly, spending on development and projects was also down by LD 2.6 billion from a projected LD 3 billion down to a paltry LD 398 million. State subsidy expenditure was also down by LD 400 million from a projected LD 4.7 billion to LD 4.3 billion. The CBL said that most of the LD 6.5 deficit was due to the failure of the National Oil Corporation to meet its oil production target of 1.2 million barrels per day due to security problems. These security problems have cost the Libyan state over LD 160 bn, the CBL reiterated. As a result of these very low state revenues, the CBL said that it has loaned the Government’s Ministry of Finance a total of around LD 70 bn from 2014 to 2017. 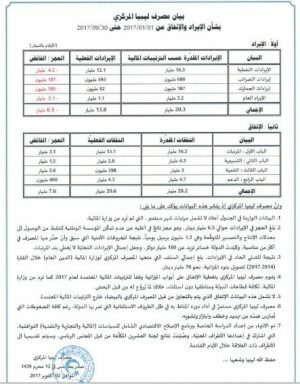 The CBL says it has disbursed money as per the Temporary Financial Agreement (as stipulated in its view by the Libyan Political Agreement) of 2017 for the whole of Libya – including the east of Libya. It refutes claims by the east that it is withholding money from the east. These latest figures do not include what the CBL refers to as the extra-budgetary spending by the eastern-based government. The eastern based and internationally not recognized government of Abdullah Thinni has been obtaining loans from eastern based banks for its spending. The CBL said that it has continued to play its role in spite of the difficult circumstances it is operating in and in spite of all the pressures it has come through such as threats, kidnappings, extortion and fake news. Finally, the CBL reported that the Presidency Council Committee of 20 has completed its special study into a comprehensive economic reform programme for reconciliatory financial, commercial and monetary policies. This will be published in a few days, the CBL reported.